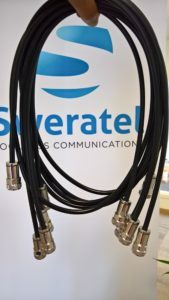 New Gen. Industrial-grade UltraFlex Thin Cable-feeder < 8 GHz Low Loss 1.5 meters High resistance copper screen (Cu), highly effective against impulsive noises. (other cable length available upon request) .Because of low-loss, excellent efficiency and impedance matching characteristics, antenna keeps clear strong signal even in crowded radio environment. The ultra flex cable consists N (Male) to N (Male) RF connector. It´s ultra flexible feature helps in easy and rapid installation still maintaining the high quality, low-loss and high performance characteristics. The antenna cable is intended for use with base-stations supporting the IEEE 802.11-family standards and equipped with N (Female) ports. Designed specifically for high-efficiency, high performance long distance coverage in outdoor deployment scenarios. The Pard UF7-Thin is perfectly designed for operation under severe weather conditions. Proper materials utilized in production of antenna cable allow operation in the salt water environment without corrosion.